Whatever they’ve been through, all our clients retain an inner wisdom that can help lift them, like a pair of ruby slippers, up and out of dissatisfaction and despair. In this recording, Lisa Ferentz will focus on helping clients reconnect with that wisdom and channel it to overcome obstacles and fear, reduce codependency, live more in the present moment, and increase positive self-talk. Explore the benefits and power of journaling and positive affirmations to help jumpstart forward movement both in and out of therapy. Implement positive affirmations in a clinical setting and help clients self-actualize and experience greater empowerment. Articulate journaling techniques in treatment for greater neural integration, more flexibility of thought, and greater range of emotion in clients. Identify technology’s clinical implications on the brain and articulate interventions to help alleviate symptoms of anxiety, depression and fear. Articulate methods by which “life lessons” can be interfaced with psychotherapy practices to improve clinical outcomes. Lisa Ferentz, LCSW-C, DAPA, is a recognized expert in the strengths-based, de-pathologized treatment of trauma and has been in private practice for over 35 years. She presents workshops and keynote addresses nationally and internationally, and is a clinical consultant to practitioners and mental health agencies in the United States, Canada, the UK and Ireland. She has been an adjunct faculty member at several Universities, and is the Founder of “The Ferentz Institute,” now in its 11th year of providing continuing education to mental health professionals and graduating over 1,200 clinicians from her two certificate programs in Advanced Trauma Treatment. In 2009 she was voted the “Social Worker of Year” by the Maryland Society for Clinical Social Work. 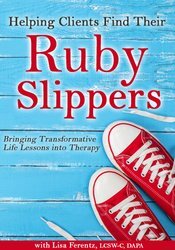 Lisa is the author of Treating Self-Destructive Behaviors in Trauma Survivors: A Clinician’s Guide, 2nd Edition (Routledge, 2014), Letting Go of Self-Destructive Behaviors: A Workbook of Hope and Healing (Routledge, 2014), and Finding Your Ruby Slippers: Transformative Life Lessons From the Therapist’s Couch (PESI, 2017). Lisa also hosted a weekly radio talk show, writes blogs and articles for websites on self-harm and self-care, and teaches on many webinars. Speaker Disclosures: Financial: Lisa Ferentz is in private practice. She receives a speaking honorarium from PESI, Inc.
Nonfinancial: Lisa Ferentz is a member of the National Association of Social Workers; and the American Psychotherapy Association. This self-study course has been approved by PESI, Inc., as a NAADAC Approved Education Provider, for 3.5 CE in the Counseling Services skill group. NAADAC Provider #77553. PESI, Inc. is responsible for all aspects of their programming. Full attendance is required; no partial credit will be awarded for partial attendance. California Alcoholism & Drug Abuse Counselors: PESI, Inc. is an approved provider by the CCAPP-EI, Provider #: OS-03-036-1019. This self-study activity meets the qualifications for 3.5 CEH's (continuing education hours). Connecticut Addiction Counselors: Provider #120924. This course has been approved as a CCB approved training and has been awarded 3.5 hours by the Connecticut Certification Board. This intermediate self-study activity consists of 3.5 clock hours of continuing education instruction. Credit requirements and approvals vary per state board regulations. Please save the course outline, the certificate of completion you receive from the activity and contact your state board or organization to determine specific filing requirements. New York Counselors: PESI, Inc. is recognized by the New York State Education Department's (NYSED) State Board for Mental Health Practitioners as an approved provider of continuing education for Licensed Mental Health Counselors. #MHC-0033. This self-study activity will qualify for 4.25 contact hours. Full attendance is required; no partial credits will be offered for partial attendance. South Carolina Counselors, Marriage & Family Therapists and Psycho-Educational Specialists: This program has been approved for 3.5 continuing education hours by the South Carolina Board of Examiners for Licensure of Professional Counselors, Marriage and Family Therapists, and Psycho-Educational Specialists. Provider #4540. Texas Counselors: PESI, Inc. has been approved as a continuing education sponsor through the Texas State Board of Examiners of Professional Counselors. Provider #: 2477. This self-study course qualifies for 3.5 continuing education credits. This self-study activity consists of 3.5 clock hours of continuing education instruction. Credit requirements and approvals vary per state board regulations. Please save the course outline, the certificate of completion you receive from this self-study activity and contact your state board or organization to determine specific filing requirements. Illinois Marriage & Family Therapists: PESI, Inc. has been approved as a provider of continuing education by the State of Illinois, Department of Professional Regulation. Provider #: 168-000156. Full attendance at this self-study activity qualifies for 3.5 credits. New York Marriage & Family Therapists: PESI, Inc. is recognized by the New York State Education Department's (NYSED) State Board for Mental Health Practitioners as an approved provider of continuing education for Licensed Marriage and Family Therapists. #MFT-0024. This self-study activity will qualify for 4.25 contact hours. Full attendance is required; no partial credits will be offered for partial attendance. Texas Marriage & Family Therapists: PESI, Inc. has been approved as a continuing education sponsor through the Texas State Board of Examiners of Marriage and Family Therapists. Provider #: 503. This self-study activity qualifies for 3.5 continuing education credits. This intermediate activity consists of 3.5 clock hours of continuing education instruction. Credit requirements and approvals vary per state board regulations. Please contact your licensing board to determine if they accept programs or providers approved by other national or state licensing boards. A certificate of attendance will be awarded at the end of the program to participants who are in full attendance and who complete the program evaluation. California Nurses: PESI, Inc. is a provider approved by the California Board of Registered Nursing, Provider #:17118 for 3.5 self-study contact hours. Florida Nurses: PESI, Inc. is an approved provider by the Florida Board of Nursing. Provider #: FBN2858. These materials qualify for 3.5 self-study contact hours. Iowa Nurses: PESI, Inc. is an approved provider by the Iowa Board of Nursing. Provider #: 346. Nurses successfully completing these self-study materials will earn 3.5 self-study contact hours. This self-study activity consists of 3.5 clock hours of continuing education instruction. Credit requirements and approvals vary per state board regulations. Please save the course outline and the certificate of completion you receive from this self-study activity. Contact us for more information on your state board or organization specific filing requirements. American Psychological Association credits are not available. Canadian Psychologists: PESI, Inc. is approved by the Canadian Psychological Association to offer continuing education for psychologists. PESI, Inc. maintains responsibility for the program. This program is approved for 3.5 self-study continuing education hours. Florida Board of Psychology: PESI, Inc., is an approved provider with the Florida Board of Psychology. Provider Number 50-399. This product qualifies for 3.5 self-study continuing education credits. Please make sure to bring your license number to the seminar so that we can report your attendance to CE Brokers. California Social Workers/ Counselors/Marriage & Family Therapists/Licensed Educational Psychologists: This intermediate activity consists of 3.0 clock hours of continuing education instruction. Credit requirements and approvals vary per state board regulations. Please contact your licensing board to determine if they accept programs or providers approved by other national or state licensing boards. A certificate of attendance will be awarded at the end of the program to participants who are in full attendance and who complete the program evaluation. Colorado Social Workers: PESI, Inc. is an approved provider with the Colorado Chapter of the National Association of Social Workers. Provider #1413. This course has been approved for 3.5 continuing education hours. Florida Social Workers/Marriage & Family Therapists/Mental Health Counselors: PESI, Inc. is an approved provider with the Florida Board of Clinical Social Work, Marriage and Family Therapy and Mental Health Counseling. Provider Number 50-399. This self-study course qualifies for 3.5 continuing education credits. Illinois Social Workers: PESI, Inc. is an approved provider with the State of Illinois, Department of Professional Regulation. License #: 159-000154. Successful completion of this self-study activity qualifies for 3.5 contact hours. Kansas Social Workers: PESI, Inc. is an approved provider with the Kansas Behavioral Sciences Regulatory Board. Provider #14-006. This self-study course has been approved for 3.5 continuing education hours. Minnesota Social Workers: PESI, Inc. is an approved provider with the State of Minnesota, Board of Social Work. Provider #: CEP-140. This self-study course has been approved for 3.5 continuing education hours. A certificate will be issued upon successful completion of a post-test. New York Social Workers: PESI, Inc. is recognized by the New York State Education Department's (NYSED) State Board for Social Work as an approved provider of continuing education for licensed social workers #SW-0008. This self-study activity will qualify for 4.25 contact hours. Full attendance is required; no partial credits will be offered for partial attendance. Expires: December 31, 2020. Ohio Social Workers/Counselors/Marriage & Family Therapists: PESI, Inc. is an approved provider with the State of Ohio Counselor, Social Worker and Marriage & Family Therapist Board. Provider approval #: RCST071001. Successful completion of this self-study course meets the qualifications for 3.5 clock hours of continuing education credit. Pennsylvania Social Workers/Counselors/Marriage & Family Therapists: This intermediate activity consists of 3.5 clock hours of continuing education instruction. Credit requirements and approvals vary per state board regulations. Please contact your licensing board to determine if they accept programs or providers approved by other national or state licensing boards. A certificate of attendance will be awarded at the end of the program to participants who are in full attendance and who complete the program evaluation. Full attendance is required, variable credits may not be awarded per the Pennsylvania State Board. This self-study activity qualifies for 3.5 clock hours of instructional content as required by many national, state and local licensing boards and professional organizations. Retain your certificate of completion and contact your board or organization for specific filing requirements.